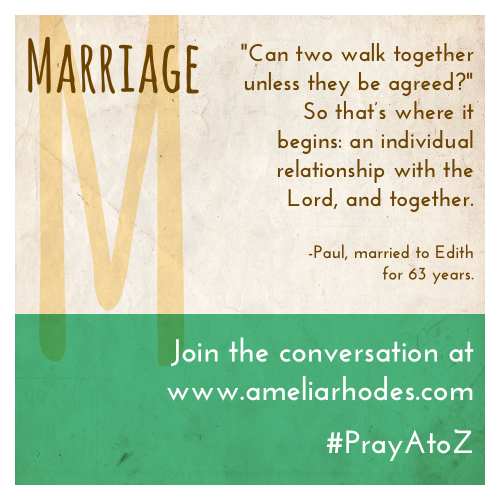 Today, we continue our series Pray A to Z, and M is for Marriage. If you’ve missed a few posts, you can get caught up on the series here. If you don’t have your printable prayer cards yet, you may download them for free, here. Paul and Edith celebrated their 63rd wedding anniversary this past summer. They raised six children, and now have at least 69 descendants. I say at least, because of upcoming weddings, and the impending births of two more great-grandchildren! I’m honored to be one of their in-law grandchildren, and for two decades, I’ve watched Paul and Edith love each other and their family through all kinds of trials. From losing an adult son and a son-in-law, to supporting each other through a stroke, heart surgery, and macular degeneration, their faith and love inspires me. I want to be like them when I grow up. I want a faith as solid as theirs, and a marriage that holds strong through the most vicious storms. I chatted with Paul and Edith a few weeks ago about married life and raising a family. As we talked, three keys to their marriage became clear. Nothing is more important to Paul and Edith than their faith in God and their love for Him. They pray and read the Bible together every single day. This habit began when their children were young. “We had devotions together every day after dinner. That’s where the kids learned how to read their Bible and look things up for themselves,” Paul explained. “The younger ones who couldn’t read couldn’t wait until they could read their own two verses like everyone else. Each child read a verse or two and everyone read until the chapter was finished,” Edith said. “It’s difficult to do, but once you get started, that’s half the battle, then it’s just maintaining it,” Paul added. I pondered that point. How often is getting started with good habits for our marriage and families the hardest part? How often do we stop before we even really get started? “So would you say that’s the most important piece to building a marriage and family, to focus on building your love for the Lord first?” I asked. “The Bible says, ‘Can two walk together unless they be agreed?’ (Amos 3:3) So that’s where it begins, an individual relationship with the Lord, and together,” Paul replied. “And doing it together really is important,” Edith added. “Some spouses will pray for the other, until the other does come to know the Lord. But if you really love the Lord and you want to serve Him, you’ll love your spouse and your kids, and you won’t think about yourself. You’ll think about them and the Lord will show you what you need to do,” Edith said. One key during the stressful years of raising six children was how they stood together in discipline and decisions and didn’t contradict each other, or try to usurp control from each other. “You agree with one another. You’re not saying ‘no’ to each other. You’re willing to do what the other person needs,” Edith said. Serving together was another important piece for unity in their marriage. “One thing we’ve done over the years is have missionaries stay at our home when they would be at our church,” Paul said. “For many years, about every Sunday we’d have somebody from church over for dinner,” Edith added. These times of serving together continued well after their children left home. They hosted missionary families and volunteered at local nursing homes until health challenges forced them to slow down. With such a busy household, I wanted to know how they maintained their marriage in the midst of hectic schedules. As we chatted, it became apparent how the simple routines of every day life were what strengthened their marriage. Whether it was taking time to talk before going to bed, reading the Bible and praying together, serving together, and having people in their home, they stood shoulder-to-shoulder building a strong foundation for life. The legacy they’ve created for their family is inspiring. Are they perfect? They’d be the first to admit they aren’t. Yet, they model faith, love, and hope in the midst of the messiness and busyness of everyday life. As we pray for marriages, whether our own, family members’ or friends’, let’s pay attention to the hundreds of small moments each day where we can build a faith together, stand together, and spend time together. Over time, these small blocks join together to create a firm and solid structure that stands the test of time. Write down your spouse’s name, and/or the names of friends and families members who are married. Write down names of struggling marriages in your community. Pray for opportunities in the everyday to show love to your spouse. Pray for marriages in your community to be strengthened by God’s power. Pray that our faith communities will be safe places for struggling marriages, and not places of shame. As we #PrayAtoZ M is for #Marriage. Thank you. This is so sweet.